The winner of the 2011 Overland Judith Wright Poetry Prize for New and Emerging Poets is Joel Ephraims for his poem ‘Rock Candy’. The two runners-up are Sam Langer for ‘Clouds fall like snow on the sky’s clear rocks’ and Patrick Jones for ‘Step by step’. Ephraims is a young and virtually unpublished poet from Wollongong whose name, I am sorry to say, was entirely unknown to me before I wrote to Overland with the news that ‘poem 423’ was to be this year’s winner. What an absolute delight! The winning poet is truly new and emerging, the poem delivered by a fresh voice demonstrating skill, intelligence and confidence, as well as an awareness of the history and culture of Australian and international poetry and poetics. 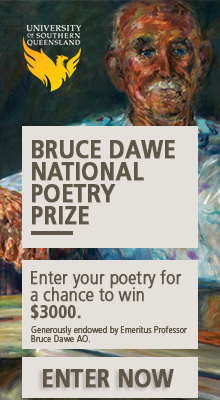 What else is Australia’s bravest poetry prize (and one of its richest) possibly for? ‘Rock Candy’ is propelled by a cinematographic kaleidoscope of desire, narrative, observation and event. The poem’s aesthetic and emotional architecture is hinted at in the image of the ‘snow globe’ that appears in the poem’s final section. Snow globes are water-filled, plastic souvenirs that display miniature dioramas amidst particles of ‘snow’, encapsulating a location or experience while detaching it from the world of the living. The procedure is both tender and brutal, as we want to hold and protect our precious lived moments, but the very holding of them requires separating them forever from the realm of the living (‘I hold my palms/against the crystal curve’). A snow globe is very much like a poem. In ‘Rock Candy’, Ephraims passes us a series of snow globes, bubbles of adolescent affection, adventure and angst, moments of hope and fragility. The bubbles are rolled, spun, thrown, popped and X-rayed, their dioramas shaken and scanned for something that might survive time’s endless wintery avalanche (‘I never want to be standing out in a rattled snow/looking in at you, you looking out at me …’). In the end they do survive, and are delicately remembered. Formally, the poem can be considered ‘innovative’ or ‘experimental’, but its moral compass, like that of any advanced innovative artwork, successfully addresses deeper questions of human existence while also testing narrative and lyrical traditions. One of the reasons ‘Rock Candy’ really stood out from the crowd (and what a rowdy, scruffy lot they were!) was Ephraims’ smart freestyling between anecdote, subjectivity and history in a manner that preserves a psychogeography that is ethically attuned and compassionate. In parts, the poem echoes Michael Dransfield’s unique contribution to Australian poetry, that crystal clear synthesis of commonplace image and romantic lyric achieved in poems such as ‘Pas de deux for lovers’ and ‘Loft’. There are also echoes of Forbes, Adamson, Hewett and Viidikas, their streetwise mediations of the prosaic (‘Subway for a feed’) and the supernaturally cosmic (‘why paint your nails comet tail blue … zodiac zigzag … diamonds from a super nova/in a butterfly net …’). Ephraims’ compelling reworking and reinvention of these various threads makes him a very worthy winner, and certainly a poet to watch. In my many years of poetry editing I’ve noticed that from one year to the next poetic ‘themes’ seem to come in waves. 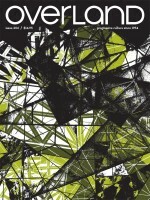 This year’s wave, or perhaps deluge, was the environmentally concerned or ecologically anxious poem. Now I don’t wish to appear curmudgeonly, and I am unquestionably sympathetic with the cause, but I must admit that I felt on more than one occasion while working through the 500-odd entries that if I were to read yet another sentimental poem about birds or rivers or mountains or tramping through the wilderness I would actually have to go outside for a moment for a breath of fresh air. Or just slaughter myself, bushman-style. A word of advice to the young poet: there are plenty of narcissistic middle-aged men out there writing neo-(small-r)-romantic poems about self-actualisation amidst Mother Nature – we really don’t need any more! It’s a waste of paper! The two runners up very neatly and very seriously leap over the enviro-eco miasma. Sam Langer’s ‘Clouds fall like snow on the sky’s clear rocks’ is a remarkably lucid account of looking at clouds at night. One of the most spectacular and beautiful cloud formations to be observed under a good moon on a still summer night is the altocumulus mackerel sky. Rather than undertake some kind of ego-correlation or assertion, Langer just stands and looks, allowing the metabolism of cognition and image-making to freely rise and form, just like the clouds. His words and images are translucent and clear, reminding us of the best imagists and conceptualists of the twentieth century, such as HD or Barbara Guest, and the acute environmental awareness of Gary Snyder. On a completely different level is Patrick Jones’ ‘Step by step’. I think it’s probably fair to say that reading Jones’ ‘slow-text mesostic’ poems (cf John Cage) is a bit like extruding the brain through barbed wire mesh. But, as the saying goes the grass is always greener on the other side, so it’s a worthwhile endeavour in the end. Jones makes an explicit attack upon the romantic self-consciousness of white Australian literary culture and its oblivious transportation of European aesthetic modes into antipodean landscapes. ‘Step by step’ is not about ‘emotion recollected in tranquillity’. Its typographical interferences and static slowdown, hook and strain the reading process, such that emotion, reflection and cognition are caught and inflected in the present-time of reading. Jones forces us to grapple with a specific set of poethical considerations: how does language-use contribute to the violence of colonisation and machineries and economies of ecological destruction? What kinds of vernacular interventions might inhibit such violence? Can poetry save the world? Jones’ poetry isn’t for everyone, but the world he is saving is the same one you’re living in. Taken together, both Jones’ and Langer’s environmental poetics are timely and welcome reminders that saving the planet is not about saving the self. There is a wonderful group of additional submissions to the prize that deserve commendation: Rebecca Kylie Law’s ‘Mirror and Girl’, Alana Kelsall’s ‘The distance till nightfall’, Ella O’Keefe’s ‘bonus’, Astrid Lorange’s ‘Kind of Health’, Fiona Hile’s ‘Mondrian Green’, Stephen Nichols’ ‘Emergent’, Andrew Slattery’s ‘Little Mountains’, Banjo James’ ‘Stobie Pole Bouquet’, Molly Murn’s ‘Find me a garden’ and Aden Rolfe’s ‘Ungainly’ and ‘Mountainousness’. As a result of discovering a group of such strong and appealing new poems, Overland and I are very pleased to announce that from this year we will be producing a small anthology of the winning and commended pieces, a special ‘new and emerging poets’ anthology that will collect the best poems from amongst the prize submissions in a freely available ebook. The first ‘Anthology of the Overland Judith Wright Poetry Prize for New and Emerging Poets’ will appear later this year.